Another Formula 1 (F1) season draws to its conclusion and it's another drivers' championship win for Lewis Hamilton. It's also been another year that has seen strong representation from Finland on the leaderboard, with Valtteri Bottas, Hamilton's team-mate, finishing in fifth position in the standings and Kimi Räikkönen placed above him in third. The continuing trend of Finnish drivers succeeding in motorsport got us thinking - just how has a nation of only 5.5m people managed to have such a strong influence on the motorsport world? However, it's not just F1 that Finns have been dominating, the list grows into the World Rally Championship (WRC), with four of Finland's own competing in the 2018 championship, namely Esapekka Lappi, Jari-Matti Latvala, Teemu Suninen and Kalle Rovanperä. Two of whom, Latvala and Lappi, occupied fourth and fifth place in the table respectively. This isn't a new phenomenon, though. Finland has enjoyed considerable success over the years in motorsport and boasts a rich history and driving tradition. Finland is home to many of the most famous drivers in the sport's history, including 1980s icon Keke Rosberg. The United Kingdom has had the most individual winners and overall wins in the F1 drivers' championship, but that owes somewhat to a population which reaches over 65m people. The win rate by nation tells a more interesting story about how inhabitants from this sparsely populated land, which kisses the edge of the Arctic Circle, leads the line. For every 1.375m people, Finland has won a title, making it a clear leader across all nations home to a championship winner. Austria is the closest competitor to Finland with a title win for every 2.193m people. In comparison, the UK win rate is over one in 3.3m people. 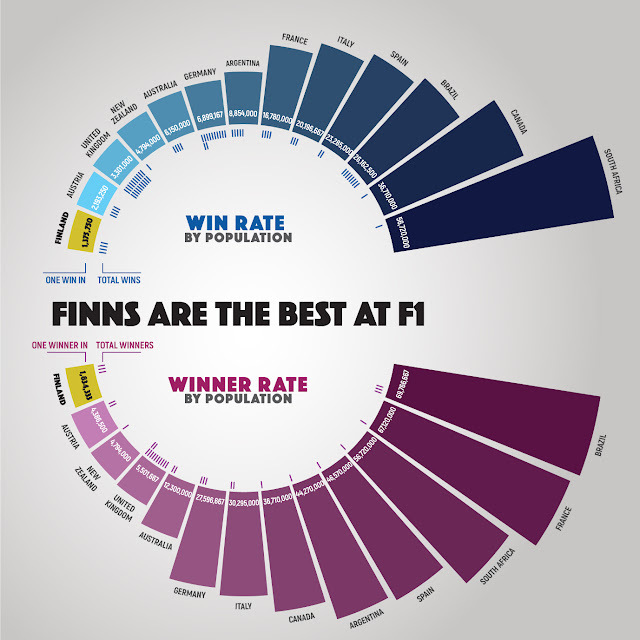 Finland also tops the charts when it comes to the number of different championship winners, with three Finns winning an F1 championship throughout history that's one in 1.834m. *All population data is from 2017. 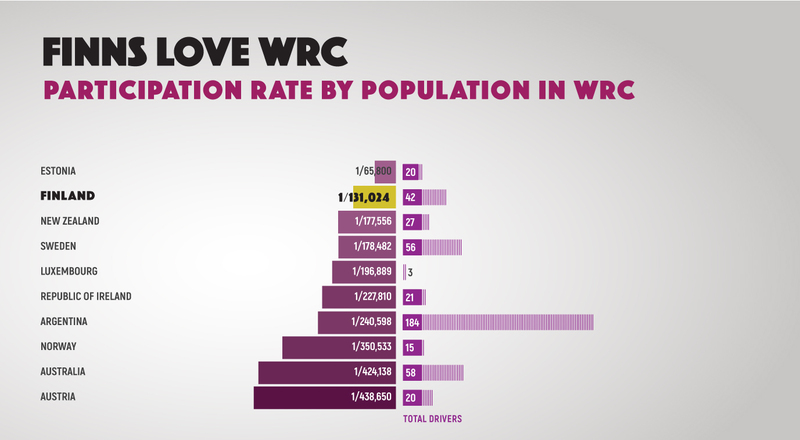 *Rates are calculated by dividing the population of a country by the number of winners / wins. Finland's story in WRC is a similar one. It has had a huge seven different WRC champions throughout history. That's over double the second-placed nation France. 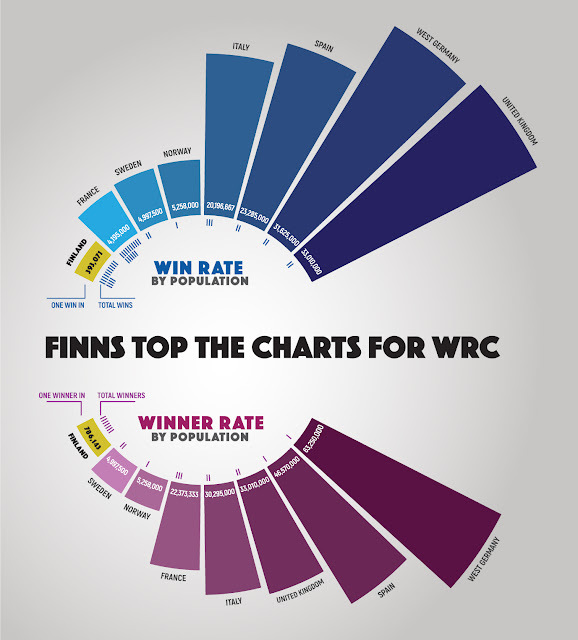 Their overall win rate by population is also untouchable, with one in 393,021 winners of the competition - over 4m more than their nearest competitor, France, which despite becoming the superpower of WRC in recent years still lags behind the Finns. *Rates are calculated by dividing the population of a country by the number of winners / wins. *All population data is from 2017 except West Germany (1990). Motorsport started to become popular in Finland in the early 1950s, due to the birth of rallying competitions. Ten years later, Finnish drivers were dominating the world of rally, with the likes of Timo Mäkinen, Pauli Toivonen and Rauno Aaltonen regularly picking up podium positions and rally wins. Moving forward into the 1980s, the success of Keke Rosberg, who was the first Finnish winner of the Formula 1 drivers' championship in 1982, catapulted the sport into the limelight in Finland. This legacy is still evident today by the amount of Finns who have participated in the two biggest motorsport forms in Europe. When comparing how many Finns have been a driver in F1 compared to the population, we found that Finland had the seventh highest participation rate in the world when discounting micro-nations such as Monaco and Lichtenstein. Again, when we discount the micro-nations of Monaco, Andorra and San Marino, who will naturally have a high participation rate by population due to their citizenship not reaching 100,000 people respectively, Finland in WRC is second, only behind Estonia. The consistency of Finland's participation in these two motorsports is unmatched by any other major nation in the world and shows how much F1 and WRC is loved in the country. So why exactly are the Finns so good? 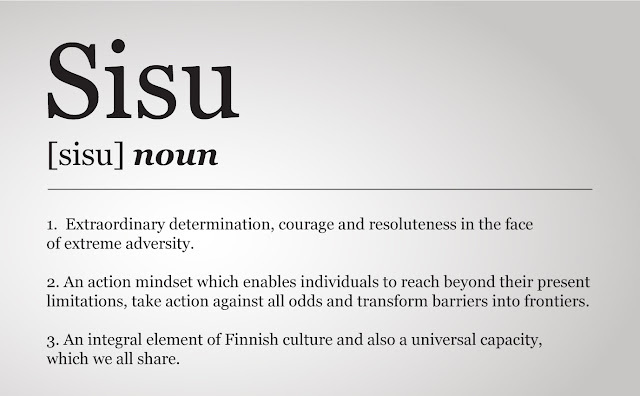 Sisu has no direct translation to English but can be roughly translated to simply "go". However, it has a much deeper meaning to the Finnish people. 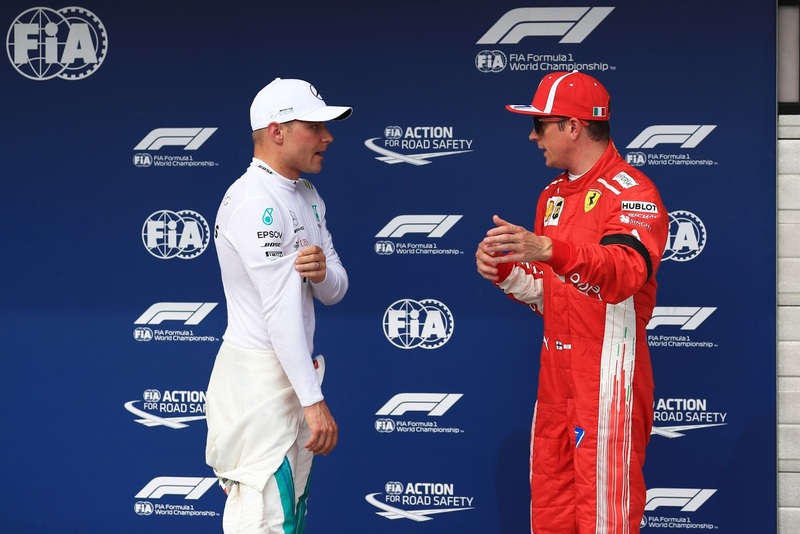 Often described as a form of inner strength and perseverance through adversity, many of its drivers such as Valtteri Bottas and Kimi Räikkönen are famous for their cool, calm and collected persona. Speaking on the mentality of Finns, former Ferrari driver Mika Salo said: "Our mentality is very good for racing – never give up. We're very stubborn, jealous and selfish people. So, you'd rather do well yourself than let somebody else do well. Everyone is very calm – not a lot of mistakes. I don't know why it is, but I am the same. Emotional things don't affect what I do at all." In total, Finland's road network stretches to approximately 454,000 kilometres (km). However, if you discount 78,000 km of highways and 26,000 km of municipal streets, that leaves around 350,000 km of private and forest roads for Finns to navigate, according to the Finnish Transport Agency. Many of these roads are quiet, often not illuminated by street lights, poorly maintained and could be mistaken for most rally stages on the WRC calendar. 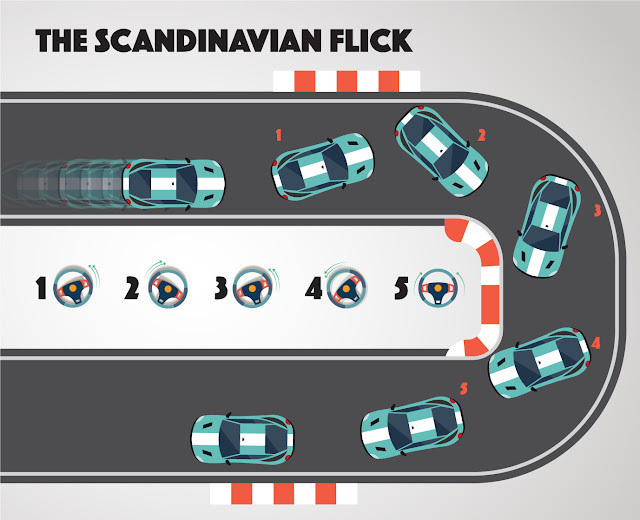 They act as perfect proving grounds for many aspiring Finns to hone their driving skills! Finnish winters are typically long and dark. Snow begins falling in November and typically lasts until at least May. During these winter months, the poorly maintained private and forest roads, which make up most of the countries transport network, become submerged with snow, which would make driving for the average European extremely difficult. The quality of many of these roads over the winter periods make rally stages look like a piece of cake! In order to prepare their children for these driving conditions, parents tend to start them off early, making use of the many private and deserted back roads throughout Finland to improve their driving. There are also a vast array of approved driver training tracks and facilities which can be partly attributed to the popularity of motorsport. The school of hard knocks is serving Finns well in motorsport, when speaking on driving in Finland, Kimi Räikkönen said: "You really have to be a good driver to survive in Finland. It is always slippery and bumpy." Once these young drivers become 18 and begin to think about taking their driving test, they have a mountain to climb. The challenging road conditions in the country mean that driving assessments must be stringent to avoid accidents in challenging circumstances. 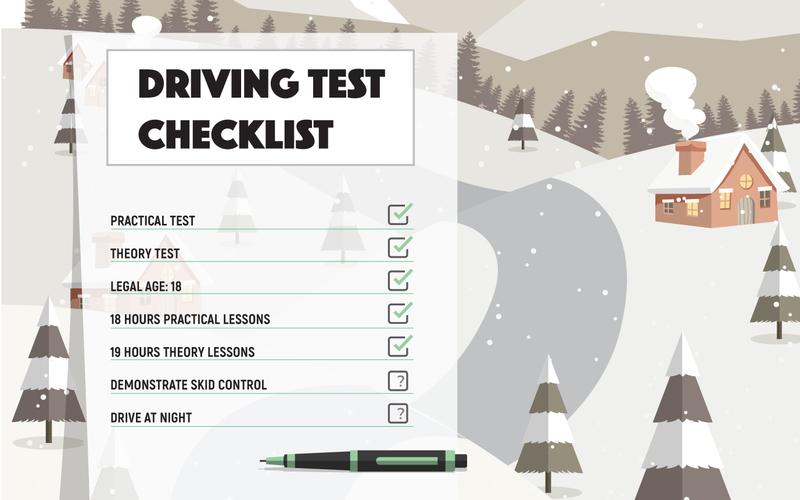 The Finnish driving test is one of the hardest in the world, with the possibility of students having to demonstrate their skid control or even their driving ability at night. Finns must undertake 18 hours of practical lessons, and 19 hours of theory before they qualify to take a driving test. Drivers are then given a two-year interim licence which requires them to undertake advanced driving classes, often using a simulator. Only once that's complete will they be awarded a full licence. Folk racing is an extremely popular past time in Scandinavia, originating from Finland. Known as Jokamiehenluokka or "everyman's class", it's a relatively inexpensive form of motorsport in which competitors turn old or unused vehicles into racing machines for little expenditure. Races are typically operated on special gravel or tarmac tracks in secluded locations. To ensure that folk racing is accessible for all, there are rules on the amount competitors are able to spend on their vehicles. The fixed price is €1400, or £1240. It's been known for drivers as young as 14 to compete. This makes it the ideal training ground for Finns wanting to gain experience before they enter the world of professional motorsport. Finnish youngsters benefit from excellent role models, with Finnish drivers rarely involving themselves in controversy. They also conduct themselves excellently on and off the track. With so many great Finns of the past, it makes sense that they should impart their wisdom to the younger generation. For example, former F1 world champion Keke Rosberg has mentored both Mika Häkkinen and JJ Lehto. Personal connections and relationships can also be a large factor in determining success. Professor Matti Urrila, who specialises in the physiological coaching of athletes and has worked with Marcus Grönholm and Mika Häkkinen recently said: "As a result of our drivers' success, Finland has an abundance of expertise in how to become a world champion in Formula 1, for instance. Beginning with sponsorship and connections, there is a very realistic understanding of what it takes. And that puts Finland in quite a unique situation." The Scandinavian flick, or Finnish flick, is a technique used in rallying to negotiate difficult corners. As the name suggests, the move originated from Scandinavian rally drivers during the 1960s who mainly drove front-wheel-drive cars. They would approach the corner slightly outside of centre. Before entering the corner, they'd then swing to the outside of the road before immediately turning in the correct direction. While doing this, the driver taps the brake pedal, causing a shift in weight to the front of the car. The 'flick' part refers to turning the steering while in the correct manner so that the car exits the corner at peak efficiency. This method of tackling corners went against the historical consensus on how to deal with corners. The Finnish flick serves as just one more example of Finland's contribution to motorsport and the innovation that they bring.